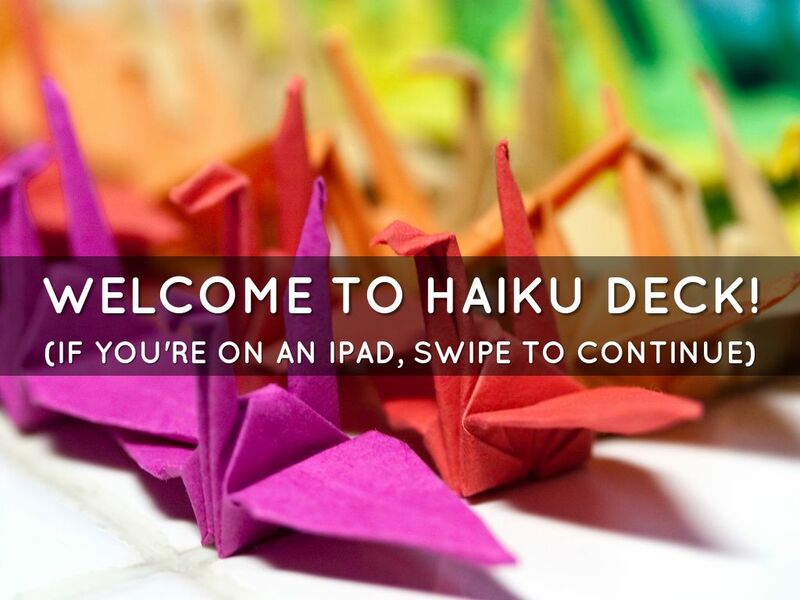 This deck is here to help you make the most of Haiku Deck quickly and easily. More detailed support is available 24/7 at haikudeck.com. Plus, you can use the '?' button for a helpful in-app overlay any time. Click the right half of this slide to continue. You should see notes below (iPad) or to the right (web). If not, rotate your iPad, or go back a step and use the play button (triangle in a rectangle) on the preview in your gallery. Now you should see notes on the right. So let's go! 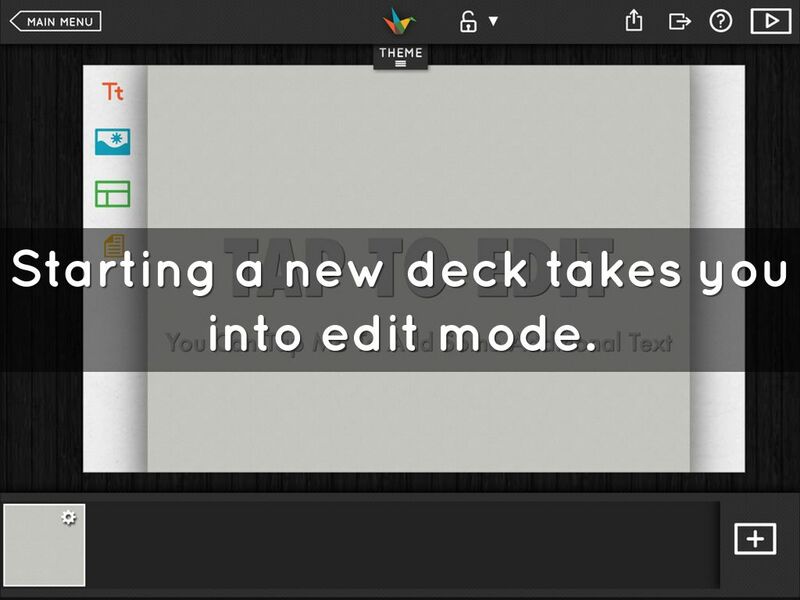 Starting a new deck takes you into edit mode. 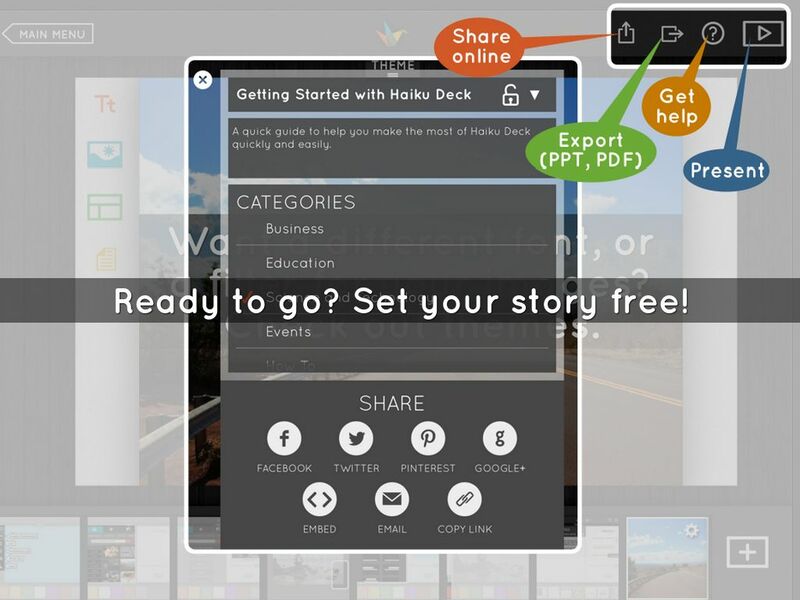 You can start a new deck on the web with the 'New Deck' button at the top of HaikuDeck.com. This button won't be available in edit mode, though -- so use the arrow in the top left to exit edit mode before starting a new project. 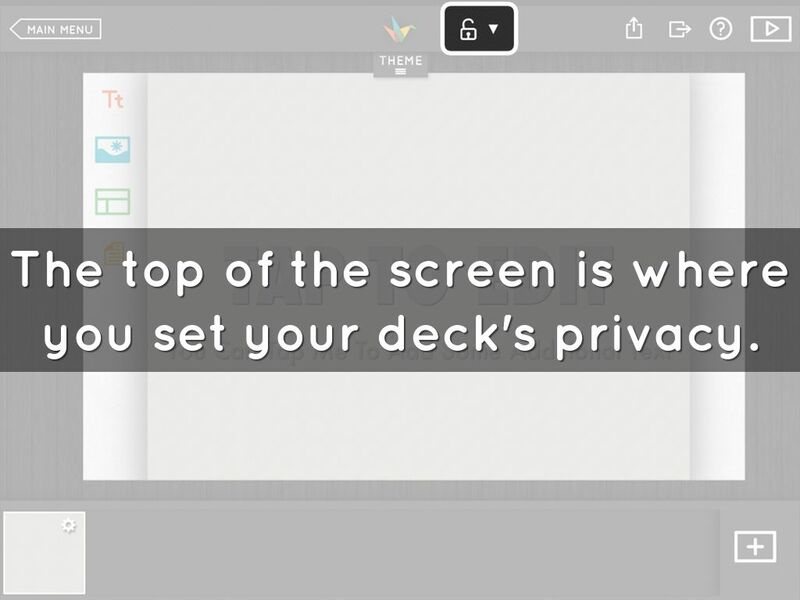 The top of the screen is where you set your deck's privacy. Explanations of the three different privacy options available will drop down when this button is clicked. Your slides are organized at the bottom of the screen. Use the '+' button to add more. There's no slide limit. For speedier syncing, exporting, etc, we recommend keeping decks under 50 slides or so. Drag slides left and right in the bottom tray to rearrange them. 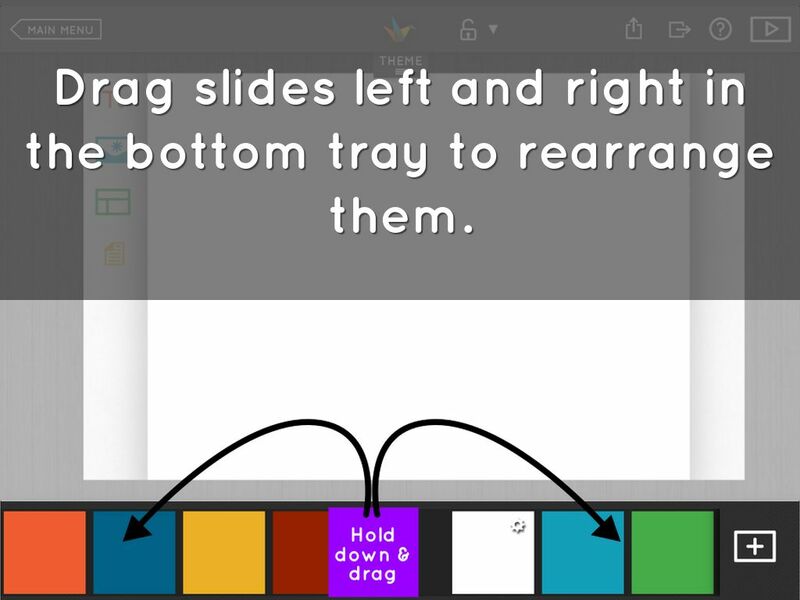 Click and drag a slide left or right in the tray at the bottom to move it to an earlier or later point in your presentation. Slide previews at the bottom also have buttons for copying/deleting. When you hover your mouse over any of the previews at the bottom of the screen in edit mode, two buttons will appear on the preview. 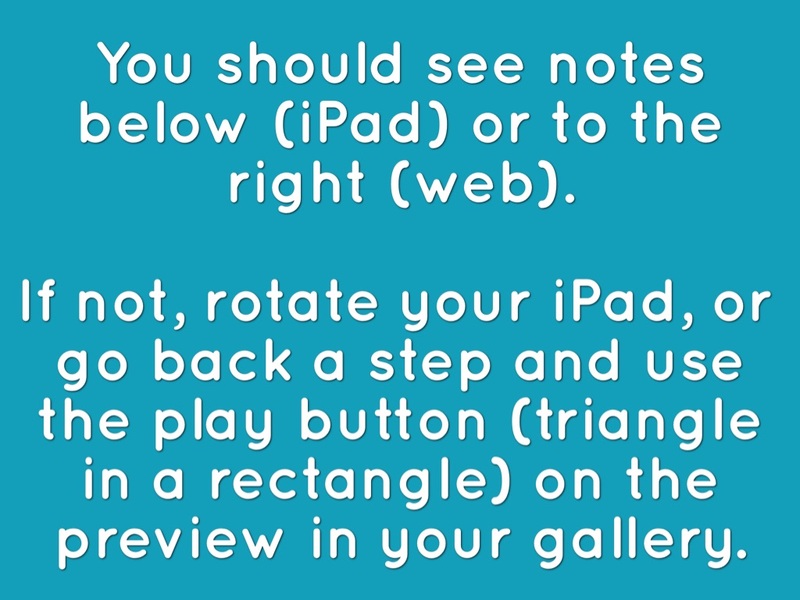 This slide features a screenshot from the iPad app, where we've compacted those buttons into a smaller gear icon. 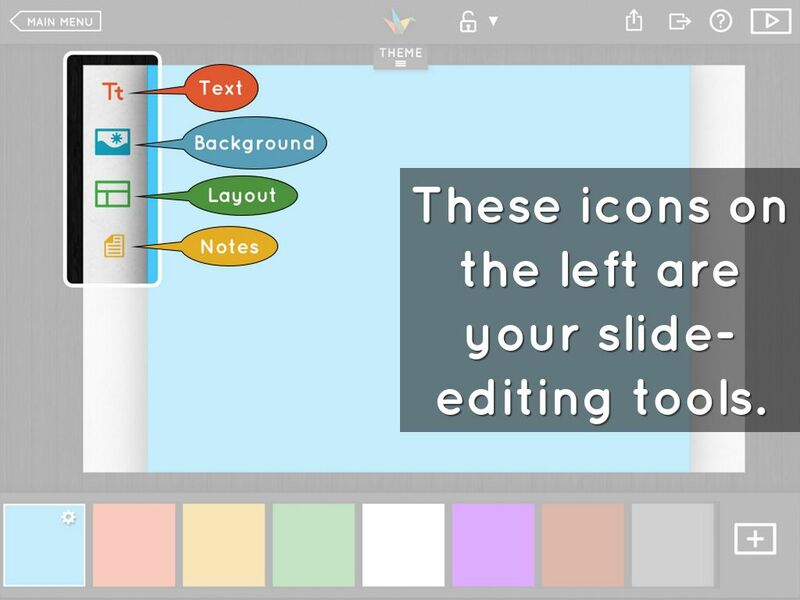 These icons on the left are your slide-editing tools. 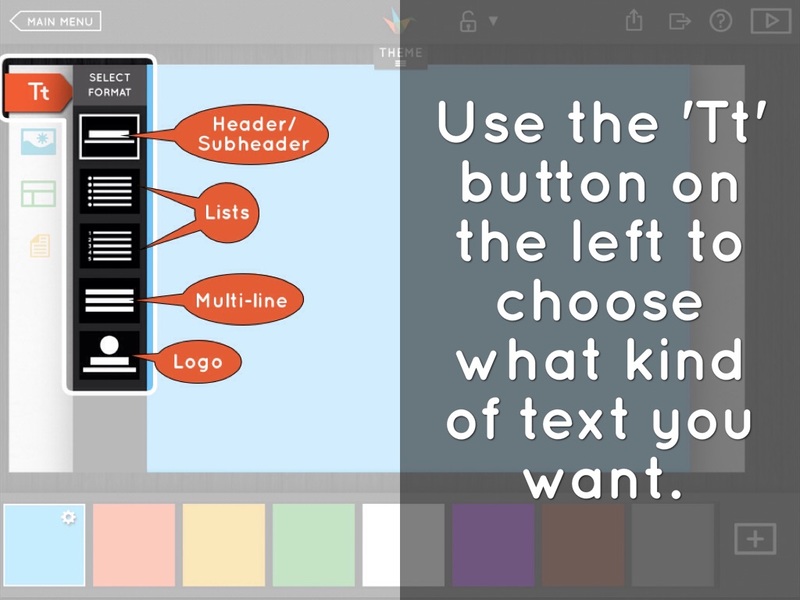 Use the 'Tt' button on the left to choose what kind of text you want. The header/subheader slide type is the default for new slides. If you have a few sentences to type, use a multi-line slide. Just leave the text fields blank if you only want to use images. Use the background tool on the left for images, graphs, or solid colors. See the three tabs at the top? They're for choosing images, graphs, or solid-colored backgrounds. The images tab is selected by default. From here, you can search for backgrounds amongst millions of free photos. You can also import your own photos from your device or the web. The second and third tabs are for charts and solid colors. 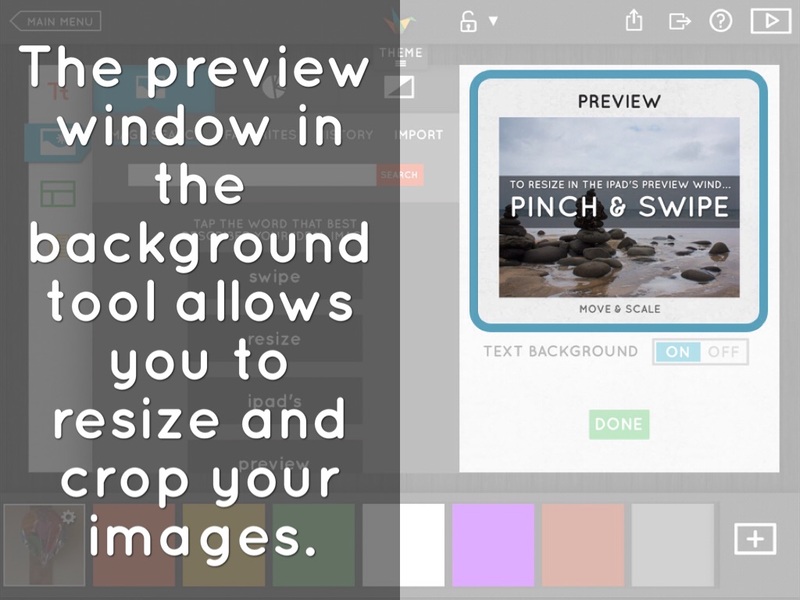 The preview window in the background tool allows you to resize and crop your images. 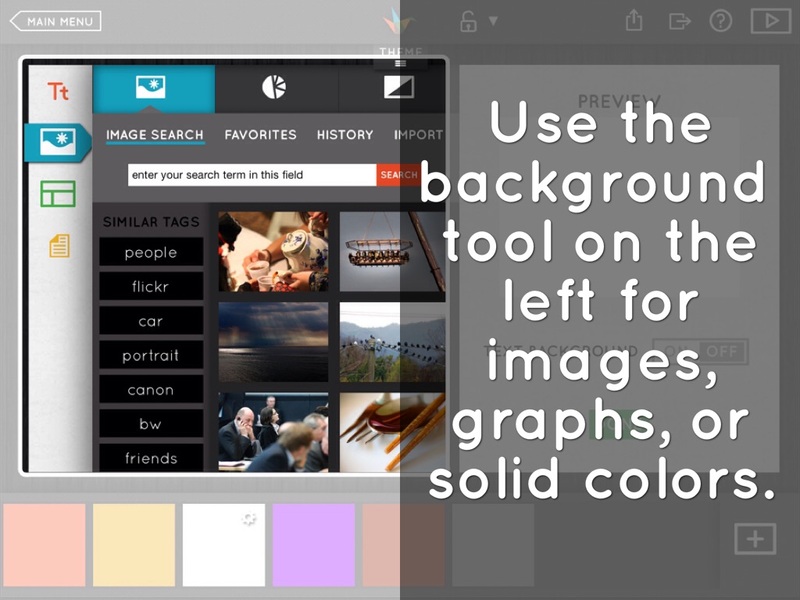 You can crop and resize your background on the web using the steps on the next slide. On both the web and the iPad, you can enable or disable the text background from here, which is the sheer black layer behind your text that helps it stand out against your background. 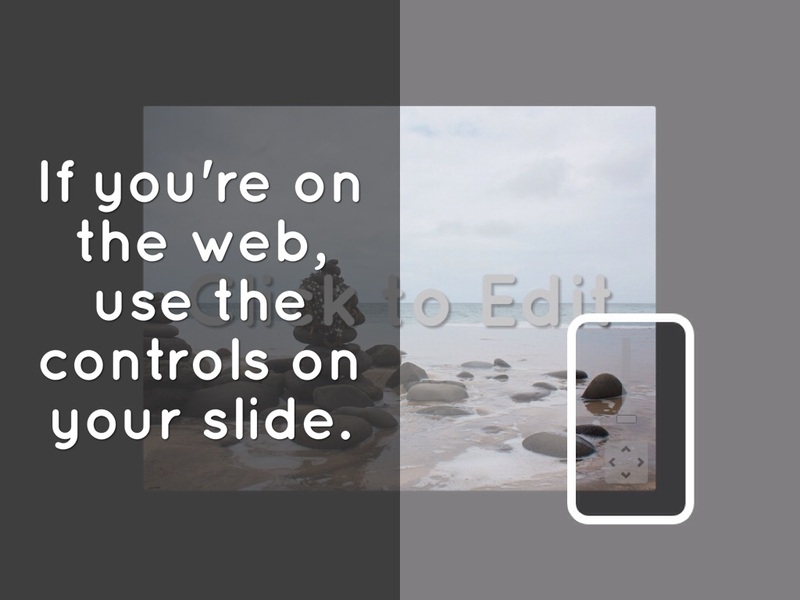 If you're on the web, use the controls on your slide. No iPad? No worries. Just use the controls in the bottom right corner of your slide to resize and crop in the Web App. 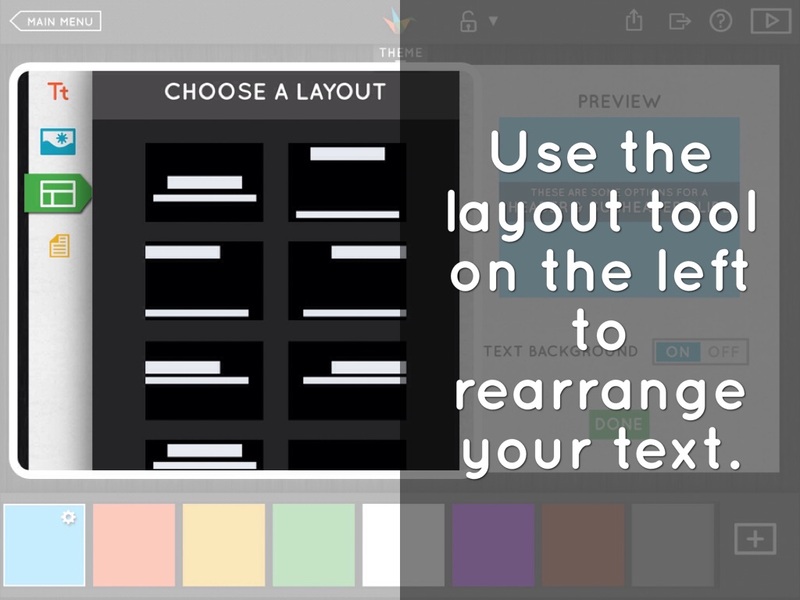 Use the layout tool on the left to rearrange your text. The layout options you can choose from will change depending on what slide type you selected under the Tt icon. The examples here are for a header/subheader slide. 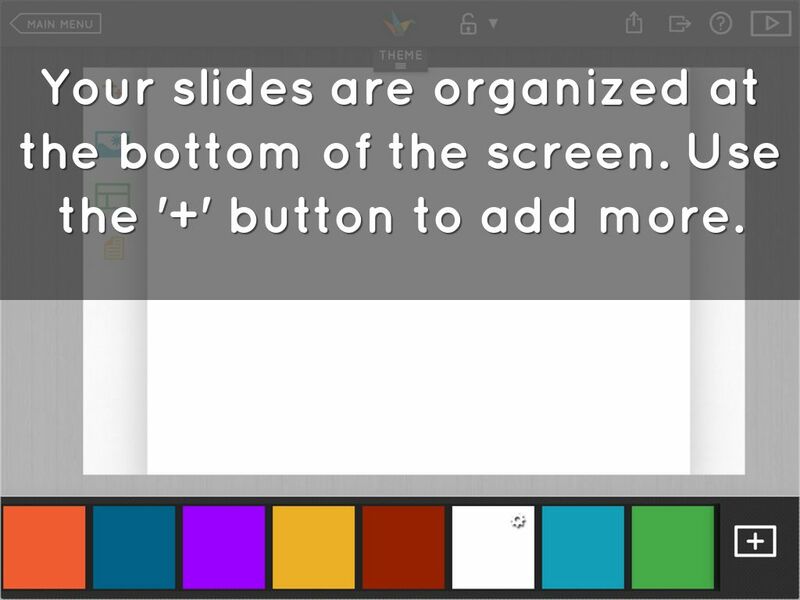 The notes tool on the left allows you to add more text to your slide, including hyperlinks. That's how I've been sending you these secret messages! 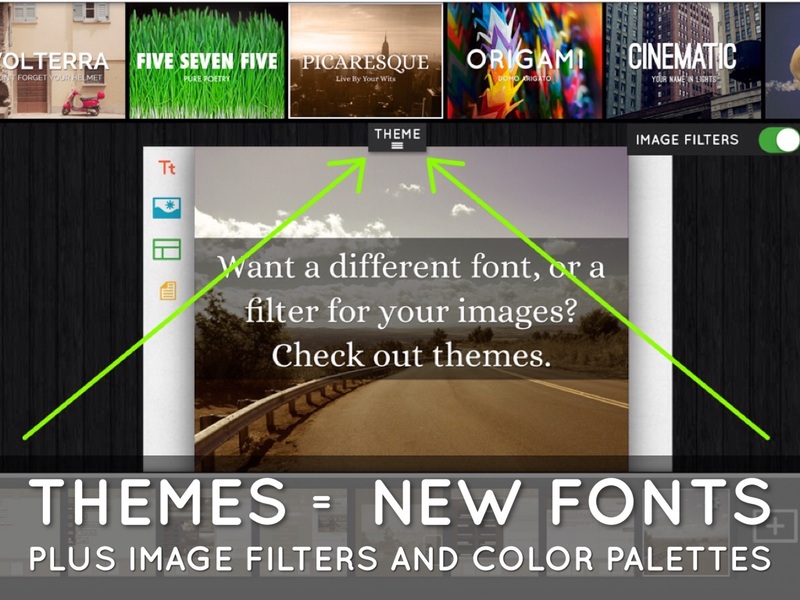 If you decide you'd like your deck to use different fonts, or if you would like to apply color filters to your image backgrounds, use the 'THEME' tab at the top. Click the tab to open or close the themes. Ready to go? Set your story free! 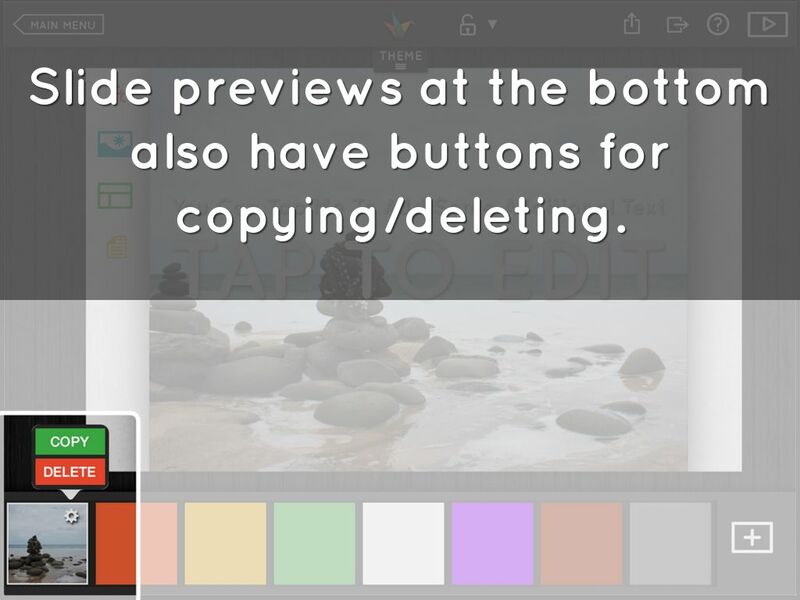 In the top right, you'll find buttons for sharing your deck, exporting it, and presenting it. When you share or export, you get a pop-up with options to change your deck's title, privacy, description, and / or categories. Options for sharing or exporting are at the bottoms of their pop-up windows. In this example, you'll find the sharing options. 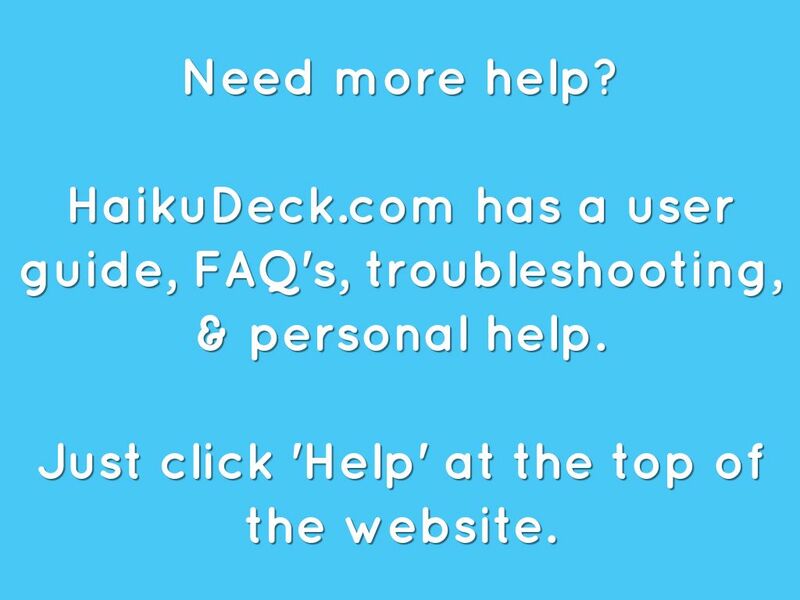 HaikuDeck.com has a user guide, FAQ's, troubleshooting, & personal help. Just click 'Help' at the top of the website.